Valentine's Day right around the corner and a handmade card is the perfect way to show someone just how much you love them. Today we are sharing some cards created by Solange and Lisa using the Head Over Heels collection that are just perfect for your one and only. The Head Over Heels collection is perfect to make love cards. 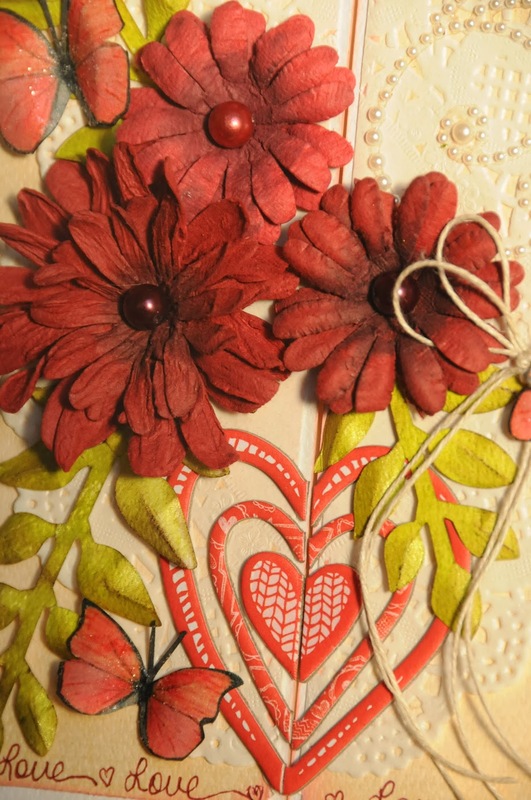 To make this card I created a grid and then filled it with hearts, buttons and other accents. I also used a black pen to add some details. I again used the Head Over Heels collection to create another love card. To get a romantic touch, I used some BoBunny Jewels. I also used several of the beautiful elements from this collection to decorate my card. Sometimes BoBunny's Double Dot paper mixed with embellishments from the Head Over Heels collection is all you need to create a special card. I created a gatefold card using 2 papers from the Double Dots Collection. I matted the Chiffon Double Dot over the Sugar Double dot. I cut a Medium Doily in half and folded it over the Chiffon Mat before adhering it to the card. I added the beautiful Wildberry Daisy Blossoms to the front - 2 on 1 side and 1 on the other. I placed some misted die cut leaves underneath and also added some butterflies I printed up to match the blossoms. The Frosting jewels added an elegant touch to the card. I used a gel pen to write the words love all around the card. Preciosas tarjetas. Una pregunta. Para enviaros mis tarjetas de San Valentin que he echo con vuestros papeles, que me encantan por cierto, como os las envio? I just LOVE these gorgeous love cards! Amazing work, Lisa and Solange! I want to receive this Valentine! EXCITING & ELEGANT - LOVE your project Solange and Lisa!! !